Mechanical engineering PhD student Shannon A. Zirbel (BS ’10, MS ’11) is shaking things up with a NASA Space Technology Research Fellowship worth up to $198,000. For her second summer now, Zirbel will ship out to NASA’s Jet Propulsion Lab, home of the Mars rover team, to apply origami in space. Origami is Zirbel’s particular brand of compliant mechanism engineering, an engineering approach that uses flexibility—think tweezers or book bindings—rather than hinges. The compliant mechanism approach cuts down on weight and friction. 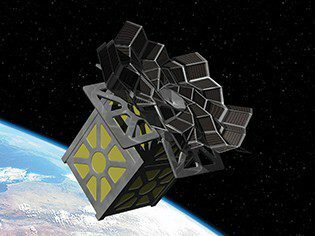 With help from mentors like physicist and world-renowned origami artist Robert Lang, Zirbel has dreamed up an unfolding flower, of sorts, to catch the sun’s rays—a solar array that would be the largest ever launched in space. “Some of it’s mathematical,” she says, but “my own personal approach tends to be to play with it—build something and fold and figure out where things aren’t working and modify the design from there.” Zirbel’s tinkering has produced answers to problems created in transferring origami to solar panels. 25 Meters is the proposed diameter of Zirbel’s solar array when deployed. When stored, the array is one-ninth the diameter: 2.8 meters. 150 Kilowatts of solar energy can be generated by Zirbel’s solar array. The International Space Station’s eight solar arrays generate 84 kilowatts—combined. $2 Million was awarded to BYU’s Compliant Mechanisms Research Group, of which Zirbel is a part, by the National Science Foundation and the U.S. Air Force to research engineering applications of origami. 156 Panels cover Zirbel’s solar array, to which solar cells are affixed.